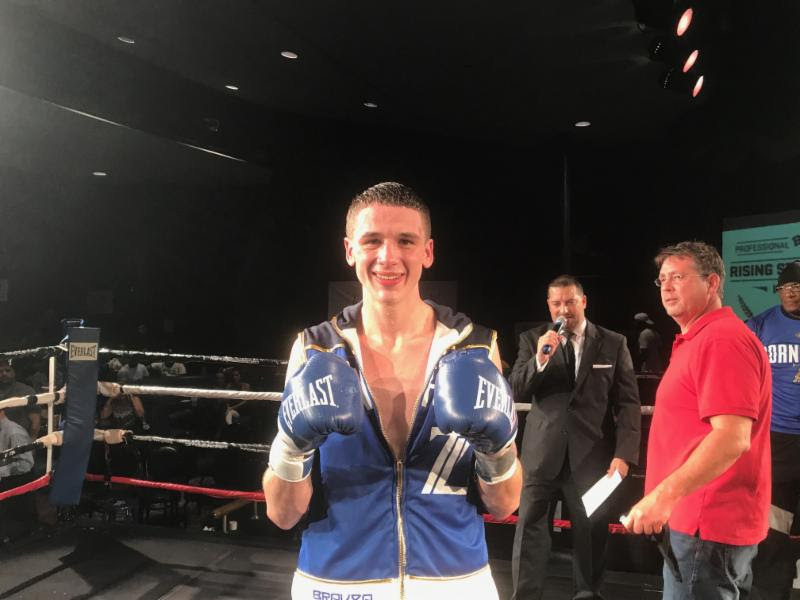 Las Saturday night, Thomas LaManna took home a ten round unanimous decision over rugged Samuel Amoako in the headline bout of an eight bout card at The Claridge Hotel in Atlantic City. The card, which was promoted by Rising Promotions was the 10th consecutive sellout at The Claridge for the promotion, who continued to solidify themselves the premier boxing promoters Atlantic City. The victory earned LaManna the LBF Intercontinental title. LaManna worked behind a strong jab and constantly had Amoako in a defensive mindset. LaManna kept up what was working for him as he used a stiff jab to set up hard body shots. LaManna out on continuous pressure for which Amoako had no answer for. LaManna, 147 lbs of Millville, NJ won on all cards by the shutout margin of 100-90 and is now 25-2. Amoako of Silver Spring, MD via Ghana is 23-17. Raymond Serrano won the WBC Fecarbox Welterweight tittle with a eighth round disqualification victory over previously undefeated Enver Halili. The fight was a war that thrilled the crowd at the Claridge. Both guys were rocked several times throughout the contest. The punches started to get to Halili as he was docked points in rounds six and seven for spitting out his mouthpiece. He spit put the mouth-guard one more time in round eight, and referee Eric Dali called off the bout at 1:34. Serrano of Philadelphia is now 24-4. Halili is now 10-1. Jorge Diaz got off the deck to take home a eight-round unanimous decision over Adam Lopez and capture the WBC Fecarbox Super Bantamweight title. In round two, Lopez dropped Diaz with a short right hand. Diaz gathered himself and began countering well and taking rounds. It was a close and competitive fight down the stretch with Diaz taking all cards by 76-75 tallies. Diaz, 121.4 lbs of New Brunswick, NJ is now 19-5-1. Lopez, 121.4 lbs of San Antonio, TX is 16-2-2. Yurik Mamedov won a workmanlike six-round unanimous decision over Vincent Floyd in a welterweight bout. Mamedov, 146.7 lbs of Brooklyn, N y won by scores of 60-54 and 59-55 twice to remain perfect at 8-0. Floyd, 146.3 lbs of Philadelphia drops to 3-4-1. Alvin Varmall destroyed Nicholas Lavin 97 seconds into their scheduled six-round cruiserweight bout. Varmall jumped all over Lavin, and finally put him down for the ten-count. In round six, Blocker began to leak blood from his right nostril. Romain, 131.4 lbs of Brooklyn, NY won by scores of 60-54 twice and 60-55. Romain is now 5-1. Blocker, 13o.5 lbs of Pleasntville, NJ s 1-10-1. Jonathan Arroyo was dropped, but hung on to make his pro debut a successful one as he took a four round unanimous decision over Steve Moore in a welterweight bout. Arroyo controlled the action, but in round four, Moore landed a hard right that sent Arroyo to his knees. Arroyo, 145.7 lbs of New York is 1-0. Moore, 146.5 lbs of Orange, NJ is 0-2. Frederick Julan remained perfect by stopping Willis Lockett after five rounds of their scheduled six-round cruiserweight bout. Julan dominates the bout until Lockett had enough, and the fight was stopped in the corner following the 5th stanza. Julan, 181.5 lbs of Brooklyn, NY is now 7-0 with five knockouts. Lockett, 182 lbs is now Takoma Park, MD is now 15-22-6.